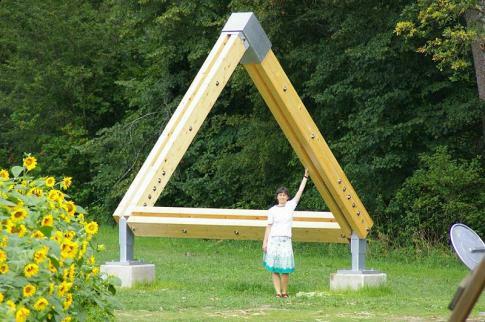 A large scale sculpture of an "impossible triangle", this one is located in Gotschuchen, Southern Austria. Image Credit: Verein "Treffpunkt Physik"
ok ok its alright no need to shout whatever it looks freaky but its just so not real so whatever people i like ones which are creapy. THIS IS IN 3 PIECES. CAMERA NEVER LIES. It is a matter of perspective. The top bars are not connected. From other angles it becomes clear that the side of the triangle are seperated by a large gap.